Did Betsy DeVos Make You Want To Run For School Board? : NPR Ed The controversy over President Trump's education secretary has brought new interest in seeking local office. Shant Sahakian, Victoria Sterling, Allison Kruk and Shae Ashe are candidates for their local school boards. Early one morning, the week before Betsy DeVos' confirmation as education secretary, 23-year-old Allison Kruk was dropping her boyfriend off at the Philadelphia airport when she decided to swing by the office of her U.S. senator and give him a piece of her mind. Kruk was a Hillary Clinton supporter, and the nomination of DeVos "just felt like a low blow," she says. "I had been calling and emailing and writing letters about how I thought she was incredibly incompetent, regardless of your position on school choice." Kruk spent 2 1/2 hours in the office of Sen. Pat Toomey, R-Pa., before she was finally escorted out by security, but not without an official audience scheduled on the Monday before the vote. Over the weekend, she collected 11,000 signatures on a petition from educators all over the state, plus letters from parents and teachers, all of which she hand-delivered. When Toomey nevertheless cast his vote for DeVos, Kruk's reaction was immediate: She decided to run for school board. By all accounts, the election has sparked a surge of political interest among young Democrats and progressives. Similar upwellings have happened after other presidential campaigns, such as the Tea Party movement's surge after Barack Obama's election in 2008. "Since Betsy DeVos' confirmation, we've had a flood of people come and say specifically, 'I want to run for school board to protect the schools in my hometown,' " says Amanda Litman, co-founder of Run for Something, a newly launched progressive political action committee dedicated to drafting Millennials for down-ballot races from state legislatures on down. Run for Something offers advice, introductions and, for some candidates, help with fundraising. 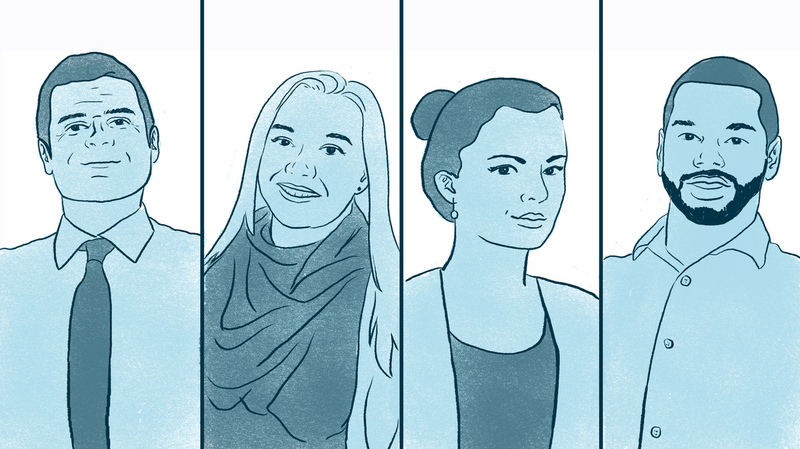 NPR Ed spoke with four young first-time school board candidates from around the country. All say they were influenced by the national energy around politics and education, but each says there was a more traditional motivation: to help kids in their communities. Allison Kruk is a financial journalist who moved to Newtown Township, in the suburbs of Philadelphia, after college. She and her boyfriend have no children, but she interned in schools and tutored in New Jersey prisons throughout college. It wasn't until she spent that weekend collecting letters from people concerned about problems that touch public schools, from gun violence to worries about immigration, that she thought of herself as someone who could make a difference through politics. "I don't just want to sign an online petition or write a post on Twitter or Facebook," says Kruk. "I want to be on the ground. Involved on the local level." She notes that Democrats didn't even put up a nominee in Newtown Township's 2015 school board elections. "That's something that Democrats and progressives more generally are realizing is essential to build a political movement." Shant Sahakian, 31, grew up in Los Angeles County in one of the largest Armenian communities in the United States. Glendale is proud of its diversity, which also includes Hispanics, African-Americans, Koreans and Filipinos. And it's proud of its public schools, which are separate from the LA Unified School District. Sahakian's first son was born one day before the presidential election last fall. "We came home on Election Day, I ran over to the polls, voted, and I was holding my son as I was watching the results thinking, 'What have I done? What am I bringing you into?' " The election solidified his decision to "graduate to a new level of public service" by running for school board. Sahakian founded a software company at the age of 14 that he still runs today. His platform centers on STEAM (science, technology, engineering, arts and mathematics); career pathways; expanding dual-language immersion; and requiring financial literacy. "With California being so underfunded, what we're missing is a vision of where public education needs to go," he says. "I'm hoping my technology experience and business background will help bring direction so it's truly a 21st century education." Having DeVos as education secretary troubles Sahakian, but also increases his resolve. "It's a little bit concerning that she's going in with so little experience," he says. "I'm worried about what changes are going to come down the pike that we at the local level have to figure out how to manage to and continue to give a solid public education." When they moved to Jefferson City, Victoria Sterling, 32, and her fiance were "excited about putting down roots," she says, and eventually adopting a child. But the people she met advised her to choose private schools. "I saw that there was a lack of trust in the school system," she says. "People are concerned about whether taxpayer dollars are being used wisely." Sterling declared her candidacy for school board on Jan. 3. For her, she says, it wasn't DeVos or national politics, but local issues that inspired her. Her platform is transparency: She wants to live-stream all school board meetings to the public. And she plans to apply the skills from her day job, as an abuse and neglect investigator for the state's department of mental health, to investigate and correct any mismanagement. Jefferson City voted two-thirds for Trump; the school board election is nonpartisan, and Sterling prefers not to disclose her political affiliation. "National politics is having a divisive effect on education issues," she notes. "Public education builds our future workforce, and the school scores are what people look at when they decide whether to live here." Shae Ashe just turned 27. He was born and raised in this borough northwest of Philadelphia, and his mother served on the school board for a dozen years. With many residents of the diverse district renting their homes, he says, the local property tax base is slight. Plus, hundreds of local students attend charter schools up to 10 miles outside the district, which further cuts into the funding for those who remain. "A lot of people here in Norristown understand that, with the way we are struggling with funding, that we're one of the districts that's going to feel an immediate impact of DeVos and her push for vouchers and more charter schools," he says. Ashe says he's the kind of born political animal who does voter-registration drives for fun on the weekends. He also started a local nonprofit to run community cleanup projects. He says that, since the election, a couple of his friends have gotten interested in running for office, too. "They are supportive and inspired. I tell people, you need to have more involvement in your local government, no matter your age. Whatever Trump may do is one thing, but what happens on the local level is affecting your daily life." An earlier version of this story, and the headline, implied that Victoria Sterling is running for school board in Jefferson City, Mo., because of the national controversy over Betsy DeVos. Sterling says that it was concerns about local education issues that inspired her candidacy.